Attorney General Eric Holder and several city police chiefs met Wednesday to talk about Arizona's new immigration law. Washington (CNN) -- Arizona's controversial new immigration law could harm local law enforcement efforts, a delegation of police chiefs from across the country told Attorney General Eric Holder in a closed-door meeting Wednesday. The officials, representing several major cities and a handful of Arizona communities, told Holder the requirement to check the immigration status of many individuals stopped by officers would divert police resources away from crime-fighting efforts and build mistrust between police and the Latino community. They warned that members of immigrant communities could become more reluctant to step forward and talk to police. "In fact, the majority of us believe [the Arizona law] will actually cause crime to increase," said Chris Burbank, the police chief of Salt Lake City, Utah. A spokesman for Holder said after the meeting that the attorney general had heard the chiefs' message. "The attorney general thought the police chiefs raised important concerns about the impact the Arizona law will have on the ability of law enforcement to keep communities safe," spokesman Matthew Miller said. The chiefs told reporters that Holder gave them no indication of when -- or if -- the federal government would file a legal challenge to the law. Holder said "there would be a decision coming soon on some of the federal issues associated with this," said John Harris, police chief for Sahuarita, Arizona. Harris, who heads the Arizona Police Chiefs Association, said law enforcement officials have consistently supported the use of more federal resources -- including National Guard troops -- to clamp down on illegal immigration. President Barack Obama plans to deploy up to 1,200 more National Guard troops to the U.S. border with Mexico, an administration official said Tuesday. In addition, the president will request $500 million to supplement current spending for enhanced border protection and law enforcement activities, the official said. "Any resources at this point are going to be useful," noted Tucson, Arizona, Police Chief Roberto Villasenor. "But I don't want to just treat the symptoms of the problem." Villasenor said the federal government must act to resolve the illegal immigration problem or face a "patchwork quilt" of state laws trying to deal with the issue. Arizona's law allows officers to check the residency status of anyone who is being investigated for a crime or possible legal infraction -- if there is reasonable suspicion the person is an illegal resident. 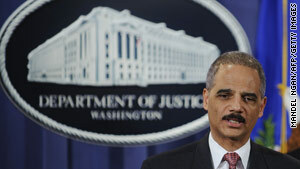 Critics -- including Holder -- have argued the law will promote racial profiling. Representatives of law enforcement groups supporting the law were not included in the delegation that met with Holder. Several Arizona sheriffs and other individual police officers have backed the measure as a necessary step in the face of what has been widely construed as a federal failure to protect the Mexican border. "Arizona sheriffs are elected officials and that changes your perspective," noted Philadelphia, Pennsylvania, Police Commissioner Charles Ramsey. Ramsey, who opposes Arizona's law, said if the measure is upheld by the courts it would be enforced by law enforcement officials, despite any misgivings they might have. Ramsey and other chiefs said they understand the public's frustration and they recognize the popularity of Arizona's action in several state legislatures.